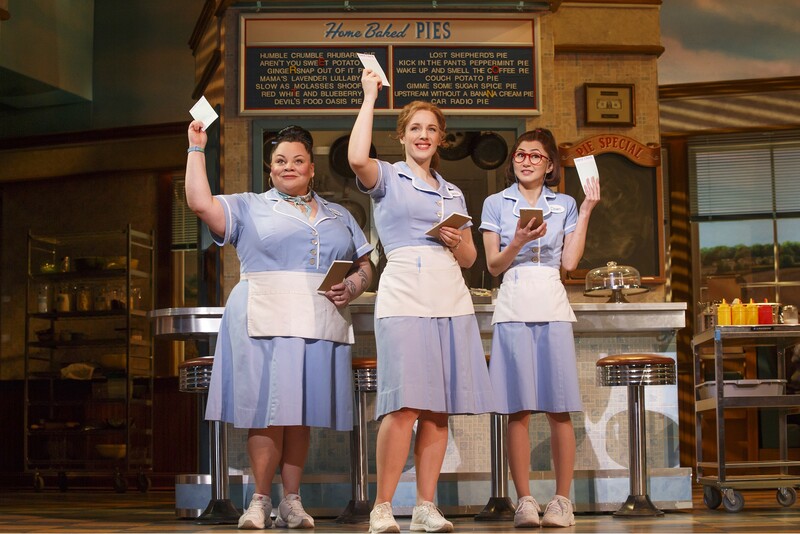 There’s no mistaking that the producers of Waitress, a new musical by Jessie Nelson and Sara Bareilles (four-time Grammy Award nominee), want to deliver something sweet for Broadway audiences. The smell of freshly baked pie wafts through the lobby and the traditional curtain has been replaced with a scrim of cherry pie with lattice topping. Based on the 2007 film of the same name, the musical throws an awful lot of ingredients into the proverbial mixing bowl. The result is an interesting bite… you might even be satisfied with a whole slice, but the recipe needs some fine-tuning. Jenna (Jessie Mueller) is a waitress in a small town diner and trapped in a loveless and abusive marriage to Earl (Nick Cordero). Her co-workers Dawn (Kimiko Glenn) and Becky (Keala Settle) are by her side when she finds out that she’s pregnant, though cook Cal (Eric Anderson) is less sympathetic. When Jenna goes to see her longtime family doctor, she discovers that she’s retired and has been replaced by the gangly and flirtatious Dr. Pomatter (Drew Gehling), who is also married. Their chemistry is almost instantaneous and the rest of the show is spent watching Jenna navigate this unexpected life shift. When not screwing her doctor, Jenna is stashing extra tip money in hopes of entering a regional pie-baking contest (a skill she inherited from her mother) and using the winnings to start a new life for herself and soon-to-be child. 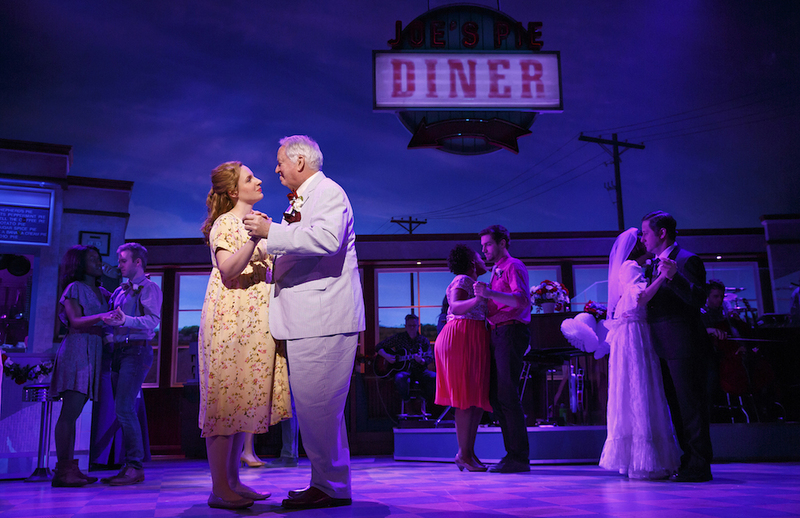 Meanwhile Joe, the curmudgeonly diner owner (Dakin Matthews), becomes an increasing presence in Jenna’s life and in an unexpected twist, sets her on a new path as the musical’s final pie is pulled from the oven. 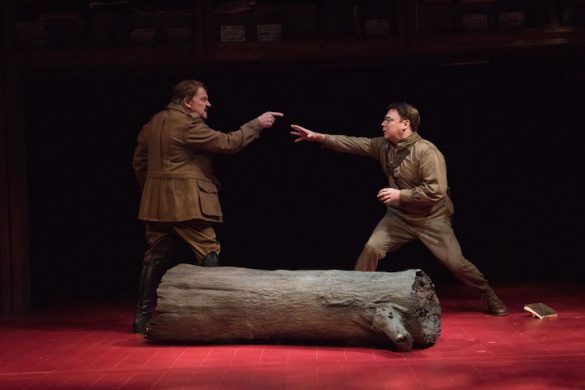 Nelson and Bareilles keep the plot faithfully plugging along and even includes some fun side antics, most notably Ogie (Christopher Fitzgerald), Dawn’s love interest with a quirky passion for American history. The score has Bareilles’s signature melodic riffs that jump octaves and twist around unexpected chord progressions. It’s a fresh sound for Broadway, not unlike the season’s other singer/songwriter crossover Bright Star. Jonathan Deans’ sound design is heavy on the band, in spite of major vocal amplification and the use of visually distracting head-worn mics. Sprinkled with humor and gravitas, it all feels a bit too familiar, and it is only Mueller’s central character that is given a dynamic arc to play. 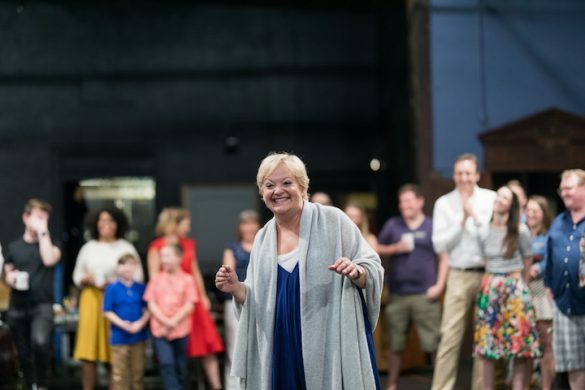 A Tony Award winner for her performance in Beautiful The Carol King Musical, Mueller is achingly magnetic to watch. Broken from a life of abuse she witnessed as a child and embodied as an adult, Mueller’s character slowly finds her voice and the strength to break the cycle. It helps that Bareilles gives her soaring material to deliver, including the 11 o’clock number, “She Used to Be Mine,” which will bring a tear to even the most jaded theatergoer’s eye. The rest of the cast does its best to bring such depth, but a pie just won’t cook in a lukewarm oven. As charming as Gehling is as an unconventional leading man, there’s barely a moment of consequence or regret (though plenty of abandonment) in acknowledging his infidelity. Only Settle’s character of Becky offers Jenna insight as to the complexities of love versus desire. 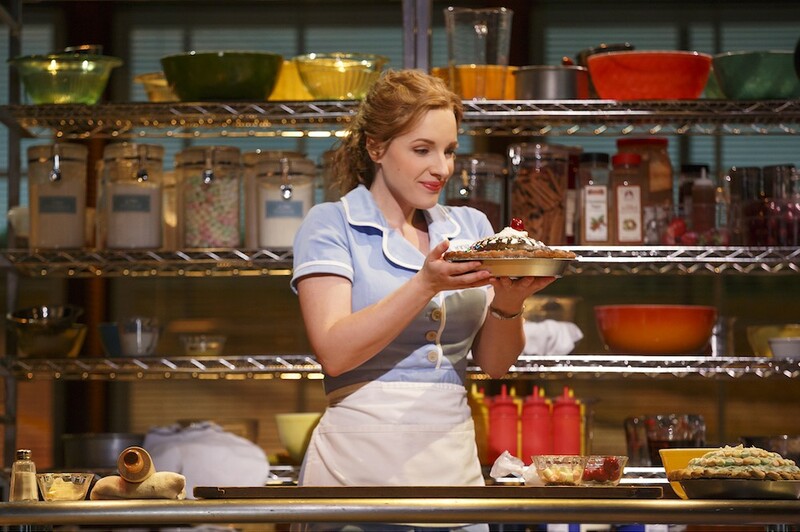 Waitress has—and will continue—to find its audience. It set a house record at The Brooks Atkinson on opening weekend for gross sales for a single performance ($145,532) and tickets are on sale through January 2017. The best reason to see the show, though, is not for the meal, but rather who’s serving it. Make sure you’re sitting at Mueller’s table.